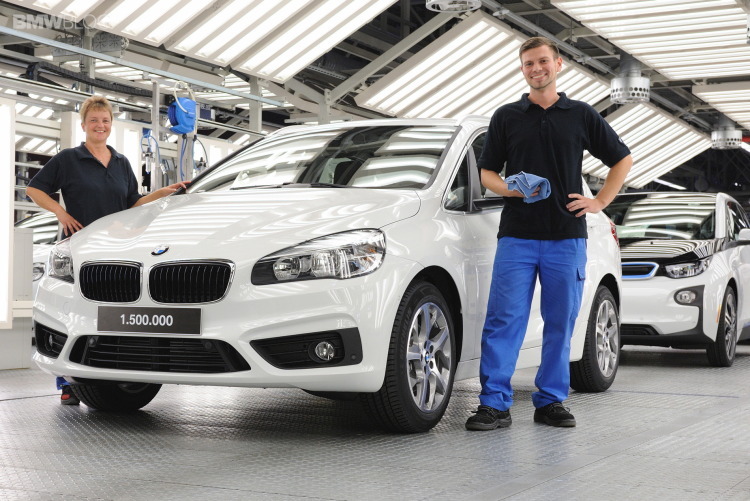 Yesterday, the Leipzig plant produced its 1.5-millionth vehicle, an Alpine White BMW 2 Series Active Tourer. The milestone vehicle is delivered to a customer in Baden-Württemberg. Production of BMW’s first front wheel drive vehicle began in July and the official market launch took place in September. Daily, the Leipzig plant produces 750 vehicle. In addition to the BMW 2 Series Active Tourer, the BMW 2 Series Coupe, the BMW X1 and the BMW 1 Series are also manufactured in Leipzig. In September 2013, BMW also began production of the i3 electric vehicle at the same plant.. In May 2014, the series production of the BMW i8 followed. The BMW Plant Leipzig is one of the most modern and sustainable automotive factories worldwide. Since the start of series production in March 2005, the BMW Group has invested more than two billion euros in the factory. Overall, more than 1,400 new employees were hired permanently in the last three years. The number of BMW employees now stands at over 4,000. Previous post What Is The Difference Between The BMW i3 World Packages?